Is your #startup pitch ready for the stage? 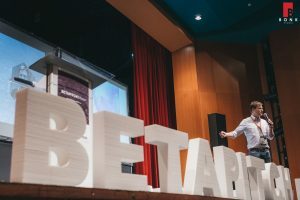 Then apply to compete at BETAPITCH Mostar 2018, the international startup competition and conference to be held on 8 November 2018 in the amphitheater of the Faculty of Economics in Mostar. All IT startups are welcome – no matter of geographical location – they would like to gather startups from the Balkan countries, Turkey, Israel, Malaysia and beyond. The winner will: – go to Berlin to Investors Day & BETAPITCH Global (15.11.2018) – travel and accommodation covered, – get direct entrance to the SPARK startup program – four months of acceleration, office space and full support by SPARK, – get 1000$-worth gift by the U.S.Embassy – this gift will be awarded to BH startups only. But other startups and visitors won’t leave the event empty-handed. Dive into a day of free talks and workshops, meetings with potential investors and business partners, panel discussions on the hottest startup topics and some serious networking. That Thursday you will have the opportunity to hear top lecturers and their experience in creating brands that matter. Event agenda will be published soon, but make sure to save yourself a spot. SPARK is an advanced digital technology acceleration platform dedicated to regional startups and projects commissioned by leading European companies. Their programs are SPARK school, SPARK r&d, SPARK startup and SPARK business. Users are individuals, teams, investors, companies, researchers, and sponsors. Become our partner and join the impact. Four months of acceleration, office space and full support by SPARK, – get 1000$-worth gift by the U.S.Embassy – this gift will be awarded to BH startups only. Apply online through the link provided as STARTUP or CONFERENCE VISITOR. Please, apply in English with your pitch deck in Google Slides or PowerPoint.